Former mayors Nicolas Platt (left) and Jordan Glatt are New Jersey's new "shared-services czars." Their rhyming names make them sound like the stars of a buddy-cop comedy. Nicolas Platt is a Republican. Jordan Glatt is a Democrat. They've known each other for 30 years. Their families once lived on neighboring farms. Both are former New Jersey mayors turned nonprofit administrators. And now they have what is perhaps the most challenging new job in all of New Jersey: trying to persuade local officials in the state's 565 municipalities to work together. As Gov. 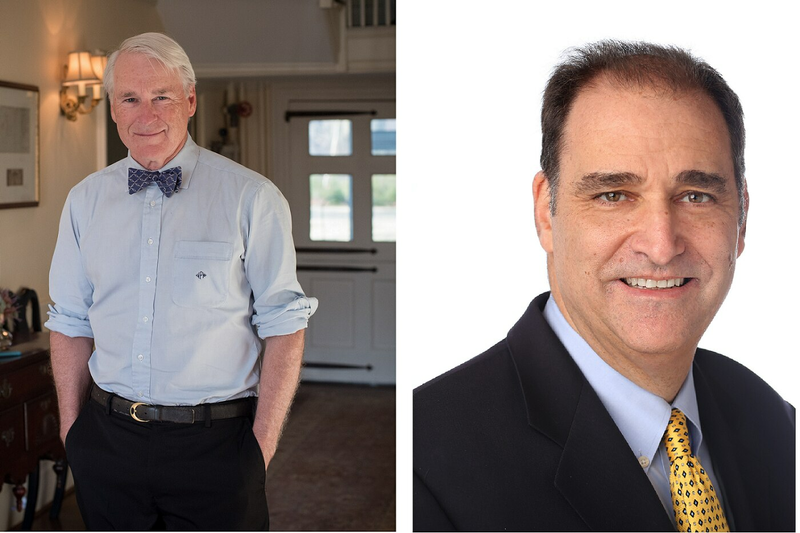 Murphy's newly appointed "shared-services czars," Platt and Glatt are tasked with helping to implement the governor's call for collaboration to make local governments more efficient, cut costs, and, ultimately, chip away at the property taxes that make the state such an expensive place to live. In the three months since the pair's appointments, local officials have emailed them every day asking for the state's help, they said. Next month, they'll meet with Atlantic City officials eager to find savings. A website will go live in the coming months. They'll host regional conferences across the state starting this fall to show officials how to collaborate. They've already identified some "low-hanging fruit" ripe for collaboration, including information technology, health inspections, human resources, tax assessing, and trash pickup. "There are some things no one will tend to show up at a town hall meeting and start raising a ruckus" over, Platt said. Of course, one town's vision of collaboration might be another's fear of consolidation: There's the concern about losing identity, control, even jobs. Saving money by sharing services can mean paring personnel. That's not usually a popular choice, especially cutting public-safety positions. Both Platt and Glatt were quick to say local officials will not hear them discuss consolidation of towns or local governments. But most are open to other ideas. "It's something I think, every town, they want to do it, but the devil really is in the details," Glatt said. "As I jokingly said, shared services is like going to heaven. Everybody wants to do it, but nobody wants to do what has to be done to get there." They aren't the only ones talking collaboration. Last week, a task force formed by Senate President Stephen Sweeney (D., Gloucester) recommended that the state require local officials to meet at least twice a year to discuss shared services, require the merger of municipal courts that have small caseloads, and allow counties to provide local police services. Platt said the senator's and the governor's initiatives are complementary and that the czars plan to work with legislators. This is despite the fact that Sweeney — who has predicted that some towns won't respond unless they're pushed — lamented the lack of authority that Murphy bestowed on the shared-services czar job. Glatt and Platt report to the governor, but as volunteers (each will be paid $1 per year), they have no power to force collaboration. Most municipalities collaborate with their neighbors in some way, including equipment sharing, police coverage, and personnel. Some counties, including Gloucester, handle certain services for their municipalities. Supporters note the benefits — economic and otherwise — of sharing services. Local officials caution that shared services won't cure the state's property tax problem, and some collaborations could even cost more money. Platt and Glatt know that. But they tick off the reasons they think they can win over municipal officials: They're not pushy, they're willing to listen, and they have experience — both within municipal governments and outside of them. Platt is chairman of the Great Swamp Watershed Association; president of the Hartley Dodge Foundation, a nonprofit that maintains the architectural and historic character of Madison Borough's municipal building; and an elected township leader in Morris County. Glatt is the director of strategic partnerships at the Community Foundation of New Jersey, where he works with people and corporations wanting to make charitable donations in the state. As mayor of Harding Township, Platt helped form a joint district court with four other municipalities. His township saved more than $200,000 per year. As mayor of Summit in Union County, Glatt helped merge health departments with neighboring communities' and reassure residents they would get the same or better service with the creation of a joint emergency dispatch service. Glatt said he anticipates "some hand-holding [and] saying, 'Hey, I've been here before. It's going to be OK.'"
They took different paths to the job. Platt said when he heard then-candidate Murphy talk about his idea for a shared-services czar, "I said, 'Oh, my God. That's my job. I was born for that job.'" Platt said some friends knew the governor and got him a meeting with Murphy. Not that Platt thinks it will be easy. "History has not been kind to czars," he recalled joking with the governor. "They usually die painfully.'" Glatt was more hesitant when Murphy asked him to fill the role. "It's a lot of herding of cats," he said. Michael Darcy, executive director of the New Jersey State League of Municipalities, said his group looks forward to working with the czars and is glad they have pledged not to force participation. "That was a very refreshing direction for us to hear from them," Darcy said. Often, he said, state task forces and agencies want to "impose a prefabricated framework on everybody." State officials have promoted shared services since at least the 1970s, said Marc Pfeiffer, assistant director of the Bloustein Local Government Research Center at Rutgers University. Legislators also have helped by passing or repealing laws. The state has long published guides and organized seminars and workshops to encourage joint efforts. This initiative "is not something new, but it's: What does the Murphy administration want to do to help local governments do a better job?" Pfeiffer said. For now, Glatt and Platt believe local leaders will at least give them a chance — even if it means the occasional bad joke about their rhyming names. "Believe me," Glatt said, laughing, "we've taken some abuse on that."